While studying at the College of Charleston, Tom Laffay’s political consciousness came not from the classroom but in the fields while working alongside Mexican migrant laborers on a farm in North Carolina. “How they were living in the shadows made me want to know where they came from,” says the St. Ignatius High School alum. With a background in Latin American studies and photojournalism, Laffay moved to Nicaragua in 2011 and Bogota, Colombia, in 2016. “I’ve never liked the idea of parachute journalism,” says the 28-year-old Laffay, whose work has appeared in The Guardian, The Atlantic and Al Jazeera. “I get really invested in a place.” Laffay’s latest project Defender, a portrait of human rights defenders under threat for their work in Columbia, is part of the Cleveland Print Room’s Anthropocene group exhibit, running 19 January to 23 February 2018. A: These are men and women defending their communities and environment, and their rewards are arbitrary arrests, fake judicial processes and death. The landscape has become so dominated by the oil industry. … Oil extraction comes first and communities are a distant second. ..
A exhibition at a Stockholm museum features portraits of human rights activists from around the world. The “Speak Truth To Power” exhibition, which recently opened at the Fotografiska Museum in Stockholm, features portraits by the late Pulitzer Prize-winning American photographer Eddie Adams. “When you see the photo exhibition you suddenly understand that human rights are not abstract,” Gabor Gombos of the UN Disability Rights Committee tells The Local. “It is very concrete in terms of activities and in terms of human rights defenders,” he adds. Gombos is one of several activists featured in the exhibit, which will remain at the museum until late November. 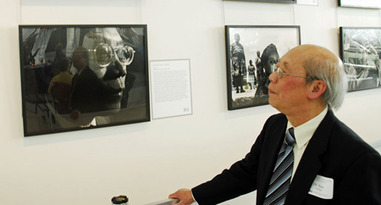 The exhibition, which also features portraits of more well-known activists such as the Dalai Lama and Desmond Tutu, advocates for “courage without borders” in an effort to raise awareness about the power of human rights. “‘Speak Truth To Power’ combines the power of arts and education to bring attention to continuing human rights abuses and to demonstrate the capacity of an individual to create change.” The exhibition is based on a book by Kerry Kennedy, daughter of late US attorney general Robert Kennedy, called “Speak Truth to Power” which contains a set of interviews with human rights activists from around the globe. Human rights photo exhibit hits Stockholm – The Local. On March 14, 2012 the Robert F. Kennedy Center for Justice and Human Rights (RFK Center) opened its “Speak Truth To Power” photography exhibition at Baltimore/Washington Thurgood Marshall Airport . “Speak Truth To Power” is a collection of powerful photographs by the late Pulitzer Prize-winning photojournalist Eddie Adams. The images document courage by featuring human rights defenders around the globe. The photography exhibit is an important component of the RFK Speak Truth To Power program, which has traveled to more than 20 cities around the world.